For decades we’ve been studying, experimenting with, and wrangling over different approaches to improving public education, and there’s still little consensus on what works, and what to do. The one thing people seem to agree on, however, is that schools need to be held accountable—we need to know whether what they’re doing is actually working. But what does that mean in practice? High-stakes tests. Lots of them. And that has become a major problem. Daniel Koretz, one of the nation’s foremost experts on educational testing, argues in The Testing Charade that the whole idea of test-based accountability has failed—it has increasingly become an end in itself, harming students and corrupting the very ideals of teaching. In this powerful polemic, built on unimpeachable evidence and rooted in decades of experience with educational testing, Koretz calls out high-stakes testing as a sham, a false idol that is ripe for manipulation and shows little evidence of leading to educational improvement. Rather than setting up incentives to divert instructional time to pointless test prep, he argues, we need to measure what matters, and measure it in multiple ways—not just via standardized tests. Right now, we’re lying to ourselves about whether our children are learning. And the longer we accept that lie, the more damage we do. It’s time to end our blind reliance on high-stakes tests. With The Testing Charade, Daniel Koretz insists that we face the facts and change course, and he gives us a blueprint for doing better. "In his new book, Daniel Koretz, an eminent testing expert at Harvard University, has skillfully dissected the multiple negative consequences of the education reforms of the 2000s." "A stunningly good, meticulously researched perspective." "A vivid and disturbing account of pervasive design problems in test-driven accountability systems, pernicious effects of high-stakes testing, and the extremes to which accountability testing has taken us. . . . In addition to being highly readable, engaging, and accessible to a broad, nontechnical audience, The TestingCharade is lucid, measured in tone, well argued, and amply documented. Koretz makes a powerful case that our test-based accountability policies are seriously misguided. His reminders throughout that testing per se is not the problem and his repeated calls for studies of better alternatives make his case all the more compelling. In the final third of the book, he begins to chart a better way forward. The ideas here are well worth attending to." 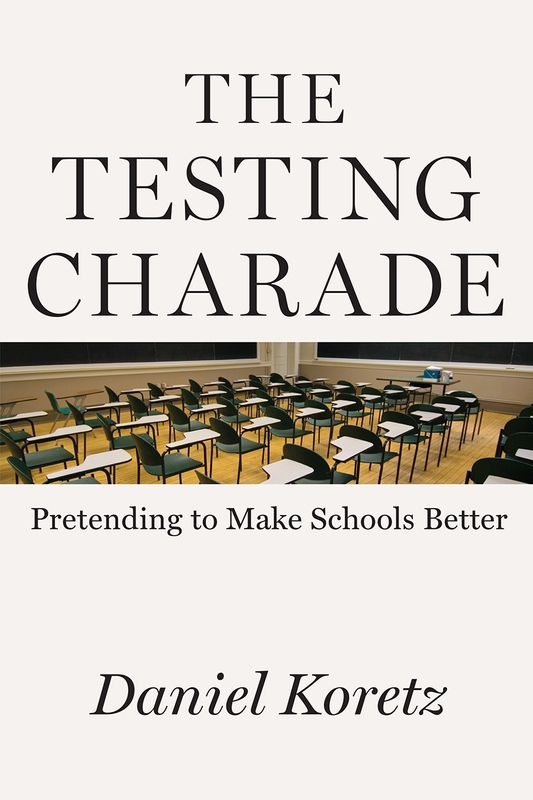 "Written in an authoritative but conversational tone that smoothly communicates both educational theory and real-world examples, The Testing Charade offers a trenchant look at one of our societal pillars." "A scathing critique. . . . What is significant about this book is the thorough and relentless critique by a testing expert who carefully and sometimes technically dissects the evidence." "Dan Koretz, a distinguished academic, turns out to be a wonderful storyteller and a gifted writer as well. Combining the latest data and moving stories of people caught up in the accountability frenzy, Koretz demonstrates that high-stakes testing has corrupted instruction, led educators to cut corners and even cheat, and produced sham increases in scores, while yielding precious little in the way of real improvements in student learning.The Testing Charade is accessible, riveting, and spot-on. Please put this important book on your must read list." "The best explanation of standardized testing."